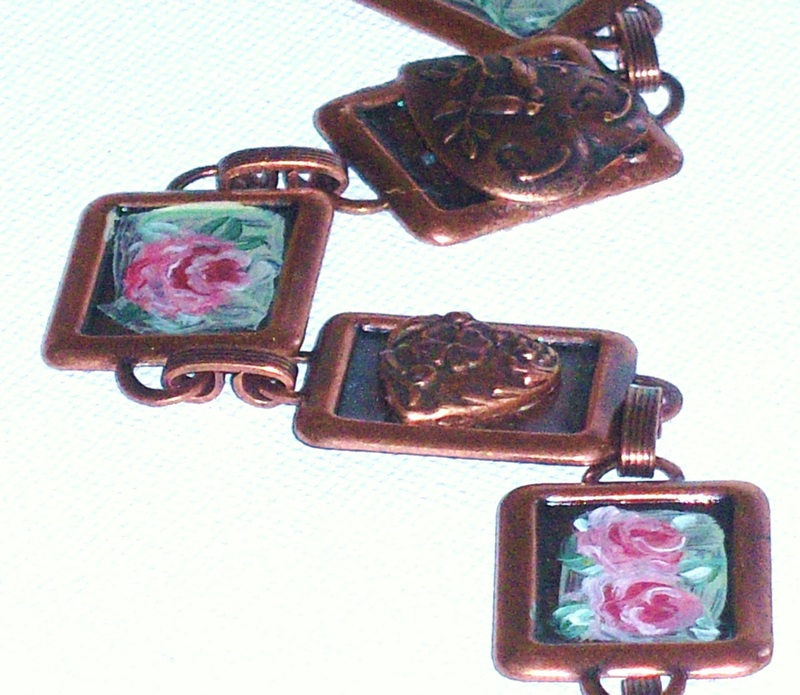 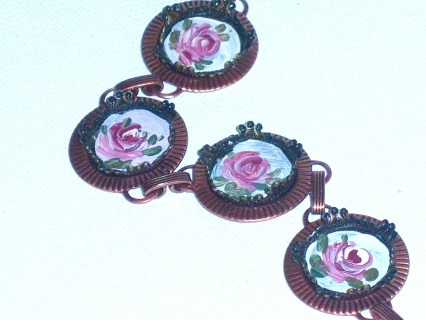 ROMANTIC ROSES I hand-painted roses on each of the antiqued copper mini frames and linked them together to form a vintage-look bracelet with a romantic and relaxed Boho look... Really pretty paired with a couple of other bracelets for a layered look! 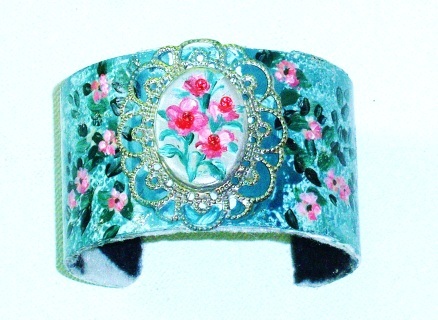 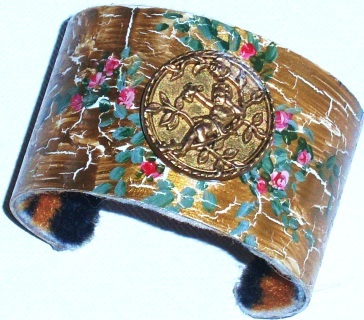 An artful cuff featuring a unique painted effect in a blue-green and silver, with tiny painted pink florals and vines! 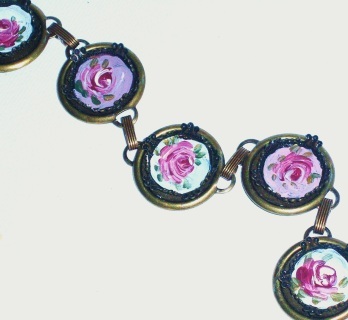 A hand-formed cabochon is the focal point, with its painted floral design, accented with tiny Swarovski crystal rhinestones, and its antiqued silver frame! 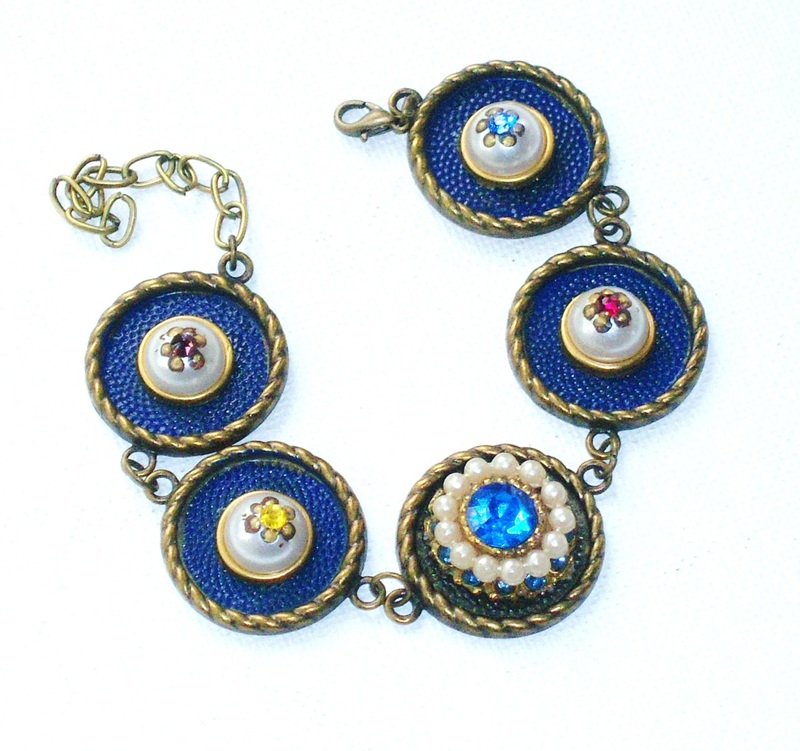 A unique bracelet featuring antiqued gold pendants, each painted blue and decorated with floral accents and Swarovski crystal rhinestones! 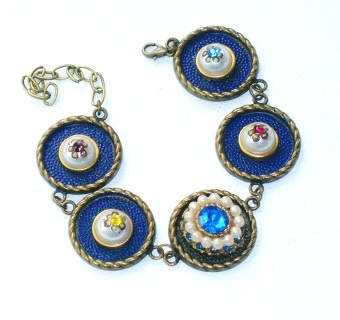 In the center, is a medallion made of sparkling blue rhinestones and tiny faux pearls! BEADED BUTTERFLY CUFF A soft, woven cotton cuff with Springtime charm, featuring a hand-painted butterfly design and hand-beaded edging! 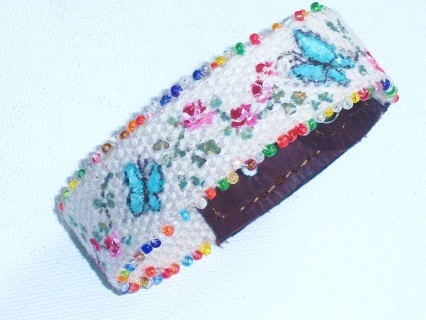 I hand-sewed tiny multi-color seed beads along the edges of this cute adjustable cuff to add a little colorful detailing! 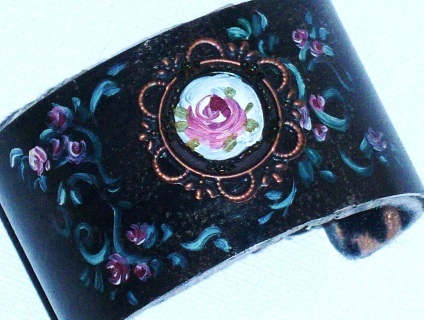 HAND BEADED A one-of-a-kind woven cotton cuff featuring hand-painted roses in shades of pink and hand-beaded details! 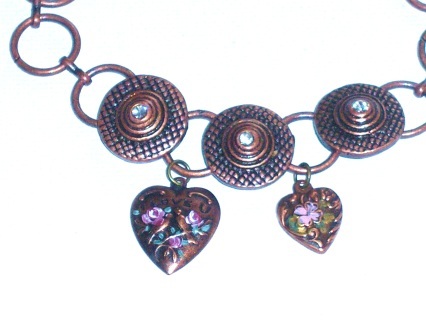 I added some tiny copper-pink, pink, and green seed beads directly to the painted design, and lined the bracelet as well to add even more handmade charm! BOHO ROMANTIC To create this ooak cuff, first I applied an antiqued gold crackle finish, then I hand-painted rosebuds in shades of pinks & sage, and completed the cuff with an antiqued gold cherub pendant... this cuff bracelet will be an artful and unique part of an outfit! 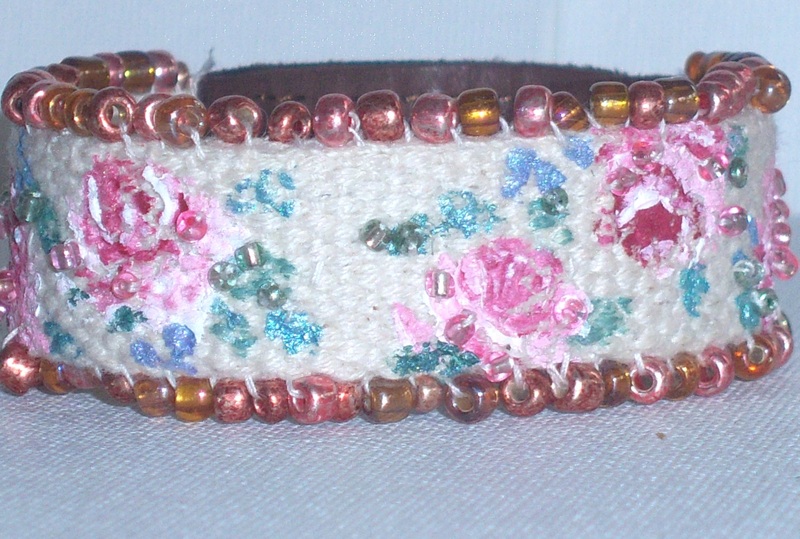 1 1/2" wide, soft felt lined for comfort! 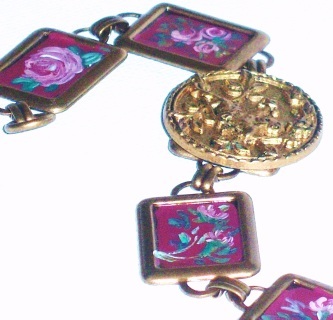 1 1/2" wide, cherub medallion 1"
ROMANTIC FLORALS Four mini antiqued-gold frames showcase floral designs that I hand-painted in soft pinks on burgundy backgrounds....a center medallion features a cherub & vine design in relief....a unique and artful creation to add to your jewel box! 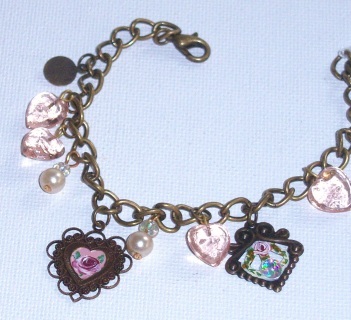 SOLD...contact me if you would like me to create a similar piece for you! MINI ROSE PAINTINGS An artful and unique bracelet, this Boho-Romantic piece features hand-painted and decorated mini frames...each individually enhanced either with floral designs or embossed heart charms...vintage-inspired and so pretty! 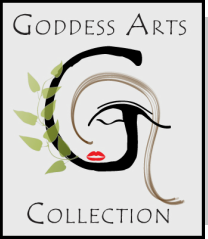 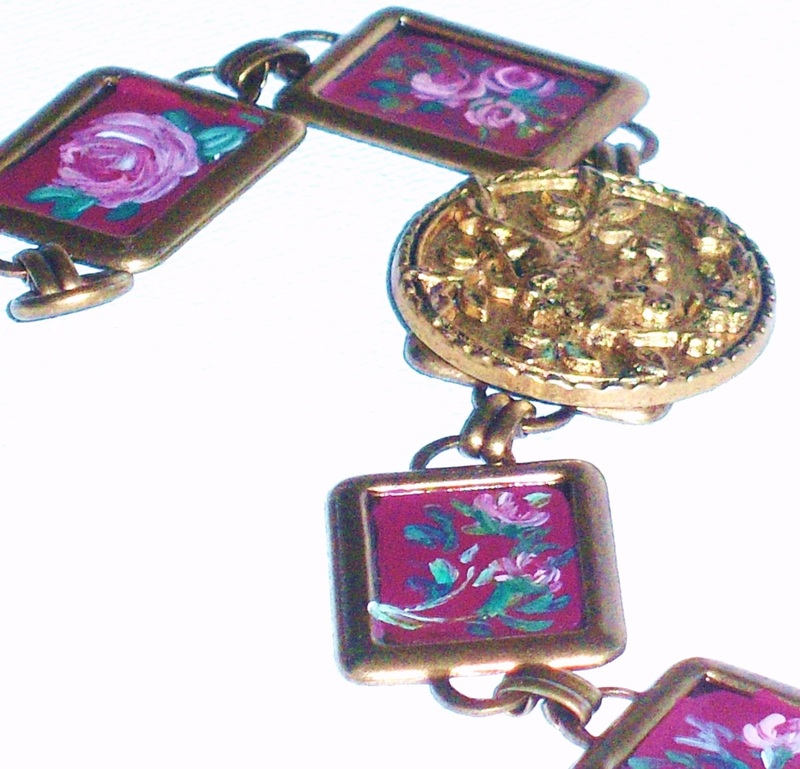 Bracelet 7", each frame 3/4", all artwork protected with a durable finish! VINTAGE HEART A silver-plated bracelet with chic romantic appeal! 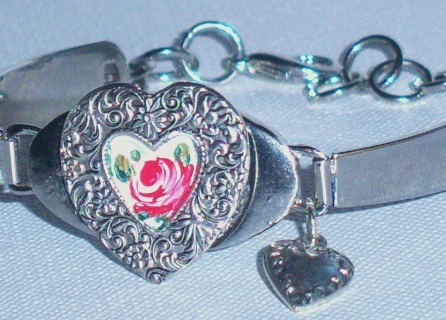 An ornate heart frames the tiny rose, hand-painted in its center on a cream background, and an embossed plated heart charm hangs gracefully off to the side. A pretty vintage accent for any outfit!